This article is about the style. For the book collection, see Xivkyn Style (collection). The Xivkyn Style is a crafting skill that can only be learned by reading the book Crafting Motifs 17: The Xivkyn or its individual chapters. These chapters (or rarely the entire book) can only be found in Trophy Vaults in the Imperial City. Crafting Xivkyn items requires Charcoal of Remorse, which can be refined from 10 Ashes of Remorse. Like all styles, it is purely cosmetic. Items will have the same stats regardless of the style you use. 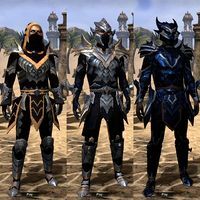 The Xivkyn Augur, Tormentor, and Dreadguard all use this style in full sets of light, medium, and heavy armor, respectively. This style was originally datamined as the "Imperial Daedric" style. This page was last modified on 24 November 2018, at 19:26.